This is the next generation of Dresden-style timpani. The older drums often sounded well but continued to have many mechanical problems. - Completely new reinforced base casting. - New cross-bar design to eliminate flexing. - All metal movable parts are lined inTeflon. - Bearing edge on kettle is machined in solid brass and soldered on to hand-hammered picking kettles. - All screws are fixed with Teflon-insert locking nuts. - Support forks are shortened, for strength, and stress points reinforced. - Double-locking casters allow for easy portability, height and tilt adjustment. - New easy read gage design so that letters can not fall off. 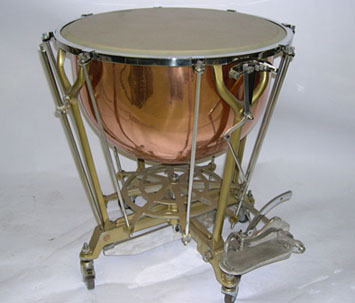 Hand screw Timpani can be converted to Chain Timpani, invented and patented by Saul Goodman.